It will arouse your interest. Red raises pulses and turns heads; scientists have found that it can even influence the perception of someone’s attractiveness. 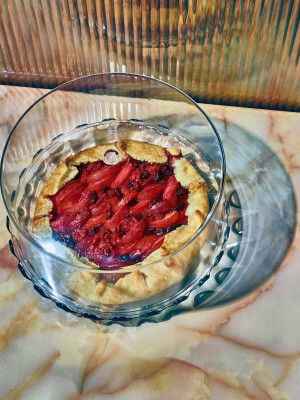 Our lady in red—a fruit galette with its plump berries, cherries, and plums left alluringly exposed—has never looked so lovely as she does tonight. Pulse flour, salt, and butter in a food processor until it forms a coarse meal. Pulse in ½ cup buttermilk just until dough starts to get clumpy. Form into a disk and wrap well in plastic wrap. Chill 1 hour or overnight. Preheat oven to 375°F. Toss the fruit with, sugar, flour, ginger, juice, and a pinch of salt until evenly coated. Roll dough into ¼-inch thick round on a lightly floured surface. Gently roll the dough up around the pin and carefully unroll onto a parchment-lined, rimmed baking pan. Arrange fruit in the center leaving a 4-inch border all around. Fold up the sides onto the fruit. Brush dough with buttermilk and sprinkle with turbinado. Chill the tart 15 minutes. Bake until fruit is bubbling and crust is deep golden brown, about 50-55 minutes.